Speeding full throttle straight towards the bottom of the barrel, Gattiger was one of Japan's clunkier cartoons, yet achieved inexplicable European success and even burned rubber across a few American UHF stations, confusing viewers for years via the miracle of home video tape. Cho Supercar Gattiger - yes, that's "Super Supercar Gattiger," for that extra bit of super - is a firey car wreck of a show, part of a mid-1970s auto-racing anime fad that crashed and burned almost instantly, leaving shows like Super Grand Prix, Rugen Kaiser, and Tobidase! Machine Flying Dragon in the impound lot. Gattiger hits the sweet spot where low-rent robot faddism and combination super-car absurdity combine, leaving a primary colored junkpile of nonsense built of parts rejected from five or ten better shows and super-glued together seemingly at random. A barely watchable parade of sawblade-equipped bugmobiles and machine-gun firing crab-cars bumping around endless, shoddily painted backgrounds, we yawn as legions of stupidly costumed off-brand Galactor thugs man their dork-vettes to be destroyed in masse by our super super car hero Gattiger, which, when combined into its super super-car configuration, looks like that stupid neighbor kid took five of your Hot Wheels and stuck them together with globs of Play-Doh. Usually combination mecha tries for some sort of combination effect that results in something new and exciting, but Gattiger is satisfied to turn five cars into one heavier, slower, less efficient and more cumbersome car. 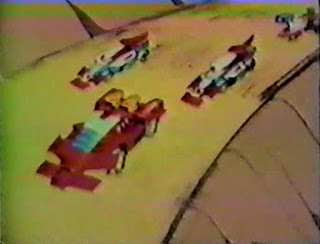 A cooperative endeavour of the Eiwa and Nippon Keizai advertising agencies, Cho Supercar Gattiger aired on Tokyo 12 (now TV Tokyo) from October 1977 until March '78. 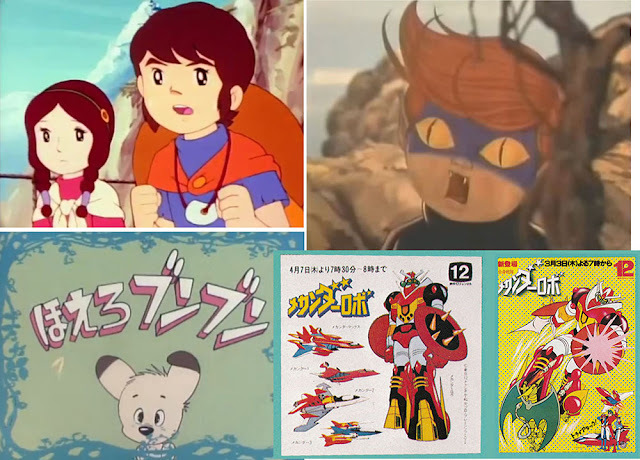 Created by Hitoshi Chiaki, Gattiger's animation was produced by Wako Productions – not the Osaka based Wako that manages comedians and singers, but Wako Pro, founded in 1965 in Nerima, Tokyo. Wako did a little subcontracting out to Tatsunoko and Sunrise but also carved out its own niche, animating the odd cut-paper version of Kazuo Umezu's Cat Eyed Boy, the Euro-insect champ Maya The Bee, one of the many Moomin anime shows, the South American adventure series Pepero The Andes Boy, super-cheap super robot Mechander Robo, Moribi Murano's charming dog comedy Bark! Bun Bun, and Dutch-German-Japanese ducksploitation extravaganza Alfred J. Kwak. Wako Pro is now called "Teleimage" and their modern business is managing old properties, not creating new ones. Gattiger's mechanical design was by Design Office Mechaman, who'd also work on masterpieces like Voltes V and turkeys like Ginguiser. The Gattiger manga, because of course there was a manga tie-in, was by Eiji Imamichi and appeared in Terebi-kun. Imamachi drew lots of licensed character comics including the 80s Tetsujin 28, Ultra Seven, Ironking, Transformers, the Red Hawk Yamato (no, not the space battleship, the OTHER space battleship) and the Tsubaraya CB-craze curiosity Emergency Directive 10-4 · 10-10. Super Supercar Gattiger's plot is confused, gas-huffing nonsense about a Demon Car Company which is run by the slightly more deranged, insanely mustached Henry Ford type Black Demon. Not content with being a filthy-rich zillionaire, he leverages his auto-making expertise into, what else, a bid for world conquest. To do this he needs the top secret super powerful solar powered combo-super-car invented by top science man Dr. Tabuchi. Well, wouldn't you know it, Demon winds up killing Dr. Tabuchi, leading Tabuchi's son Joe to swear eternal vengeance by means of the selfsame solar powered super-combo-5-in-1 Gattiger. Helpfully titled "Center Machine", "Left Machine", "Right Machine", and so forth, this rolling Pick-A-Part lot is driven by the Tiger Team crew of Sachiyo (girl), Kotomi (girl's kid brother), Ken (the big guy), and Hayami (quiet guy), who subsequently pop their five individual clutches and tell the world to eat their five individual dusts. As the worldwide auto-race battle heats up we learn Black Demon's second in command, Queen Demon, is actually Joe Tabuchi's mother and that Black Demon Mustache himself is Queen Demon's father, which makes him Joe's grandfather, and which also means every once in awhile Queen Demon puts on a Racer X mask and races incognito to help Joe Tabuchi, because that's what mothers do. In a series of nonsensical auto races through rugged, desolate, easily drawn territory, the Gattiger team races and wins against the Black Demon Auto Racing Team, with the fate of the world, or at least several lucrative endorsement contracts, in the balance. And no, kids, let's not confuse Super Supercar Gattiger with the hero of Toei's 1975 short film Uchuu Enban Daisensou, or "Great Outer Space Flying Disc War", the proto-Grandizer film starring an outer space refugee who pilots a super robot known as Gattaiger. Because that would be silly. Sure, Uchuu Enban Daisensou is dopey robot nonsense, but at least it features a robot panther, a big-haired outer space Farrah Fawcett, and a mercifully short 20 minute run time. Our combo-super-car-super-Gattiger super story races to a furious climax as Black Demon general Eric murders his rival Queen Demon with radioactivity. Joe and the Tiger Team face off against Eric in a super car showdown that Eric loses, bringing justice to the galaxy of super-car auto racing. Stricken with the loss of both Eric and Queen Demon, Black Demon himself pilots the massive super attack... just kidding. Black Demon blows himself and his entire Demon Auto Company to smithereens. The end, drain the fluids, put the wheels up on blocks, throw a tarp over it, we're done. The show has a flat mid 70s look; you could easily be watching any number of boring Nippon Animation robot disasters (Blocker Gundan 4 Machine Blaster, Ginguiser) or clunky pre-Takahata Zuizo Eizo kidvid starring bears or woodchucks or raccoons or bluejays wearing hats and little ties. The animation is passable at best and that's a generous assessment. Lots of lugubrious male-vocalist songs exhort us to "hear our courage groan" and "get rid of the pain by stepping on the gas," while the audience looks at its watch and waits impatiently for another fuel shortage. So why are we even talking about this show? Sure,the show was a hit in Italy, a nation known for its enthusiastic disregard for auto safety, but why did San Francisco's Fuji-TV see fit to translate and subtitle Gattiger and broadcast it to an America that was clearly not ready? 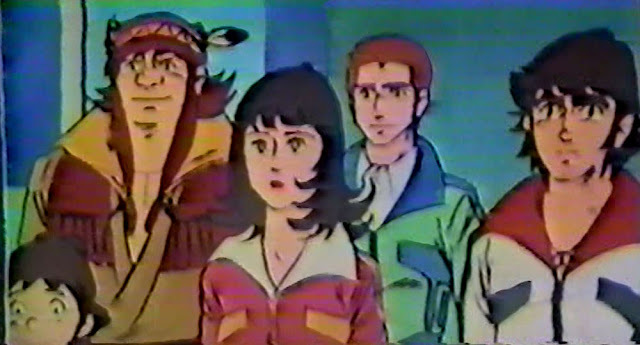 Why did the newly-minted Japanimation fans of that era roll tape on what must have, even back then, been seen as a fairly dopey show? 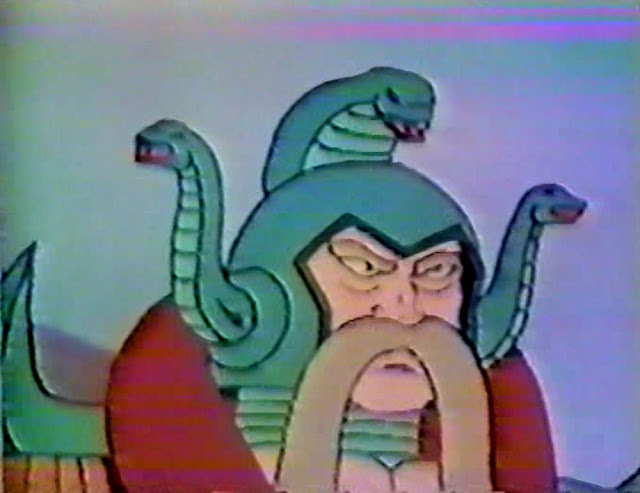 How did it wind up tacked onto the end of a VHS of 1990's "Devilman : Evil Bird Sirene"? To be perfectly frank, Gattiger exists in America for the same reason it existed in Japan – to sell toys. Takatoku produced a few versions of Gattiger rolling stock that must have seemed like a good bet for American retailers, as Fuji-TV's Gattiger broadcast includes a tremendously misleading ad for Gattiger toys and the address you can write down and hector your parents into driving you to. I found my Gattiger Center Machine at a comic shop in Massachusetts, which only goes to show you never know where these anime things are going to pop up next. Sure, totally lame anime like Gattiger is always good for a chuckle, and the show is useful in keeping the anime conversation from getting too pretentious. Beyond that, in spite of its many design flaws, we can point to Super Super Car Gattiger as proof of the raw power of Japanese animation, that even the speed bumps and potholes of thin, derivative premises can't slow anime down.